I grew up in a small town called Waterford NY. Waterford is located in Saratoga County and is the junction of where the Hudson River meets the Erie Canal. Lots of boats pass this small village each year traveling through the Erie Canal across NYS. Growing up in Waterford I saw many boats of all shapes and sizes traveling through our town daily on the Erie Canal. Boating always interested me and I seem to have always lived near some sort of body of water. On a trip out to Seattle Washington, I was out on Lake Union and came across one of the first ever CycleBoats built. Immediately I knew Buffalo would be the perfect place for this with our expanding waterfront. After a year of planning and development we launched the only CycleBoat in New York State right here on the shore of Lake Erie in 2017. I did my undergraduate at Fredonia State majoring in Business Marketing. I went on to Canisius College for my master degree in International Business. 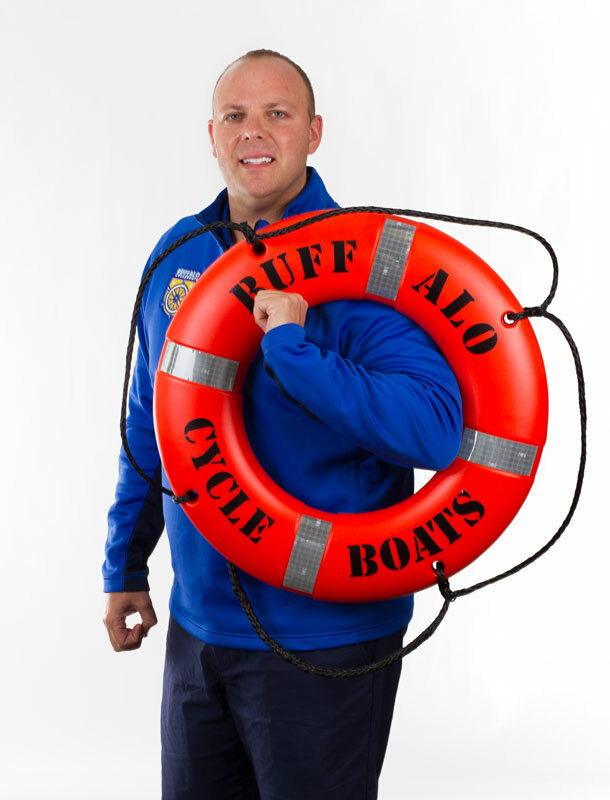 My greatest accomplishment so far was taking the idea of Buffalo CycleBoats and developing this into an actually successful working business/brand in a short period of time. Within one year we turned into the top activity to do on the Buffalo waterfront. From locals to tourist, it makes me feel good taking people out on the water for the first time and showing them Buffalo from a different point of view while getting a little physical activity in! What is your favorite part about Buffalo? Honestly I can’t narrow it down to just one, so first I would have to say the people of Western New York are like no other. There is a reason why they call it the city of good neighbors! The second is hands down the food! Buffalo knows how to eat and very well I must say. Can you give us an overview of your company? Buffalo CycleBoats is an incredibly unique experience, as we have combined a boat, bike and a bar all in one! It’s a 30-foot-long catamaran that is propelled through the water by a large rear paddle wheel, that’s powered by the pedaling of our riders. We can accommodate up to 16 guests (10 at pedal stations surrounding a central mahogany bar and the other 6 riders on comfortable bench seating. We embark on daily cruises on the waters of downtown Buffalo on the Buffalo River. How many times have you personally rode in the Buffalo Cycleboats? I personally try to be on at least 5-10 cruises each week. I would say I have at least over 120 cruises under my belt on the shores of Lake Erie.